The yellowfin tuna is one of the largest tuna species, reaching weights of over 300 pounds (140 kg). 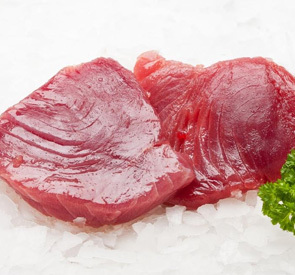 Yellowfin tuna is widely used in raw fish dishes, especially sashimi. This fish is also excellent for grilling. Yellowfin is often served seared rare. 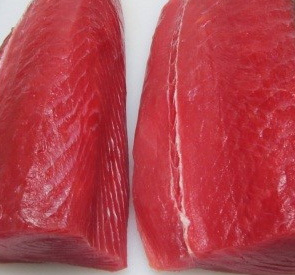 Yellowfin buyers recognize two grades, "sashimi grade" and "other", although there are variations in the quality of "other" grades. Packaging :2-3 fish in corrugated box in a polythene bag with gel & dry ice. Sri Lanka's Leading Seafood Processor, Supplier & Exporter to USA, Canada & Europe. Indian Ocean is blessed with vast resources of marine wealth throughout the year. Damam K International is a import & export company based in Sri Lanka, which is a leading supplier of high-end & premium quality sea food products. 135/5 Church Road, Mattakkuliya, Colombo-15, Sri Lanka. 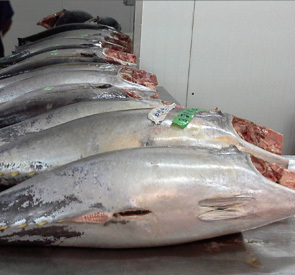 Seafood Exporter in Sri Lanka, Fresh Tuna Supplier & Exporter in Sri Lanka, Fresh Tuna Loin Exporter in Sri Lanka, Tuna Whole / GG, Tuna H&G, Fresh Tuna Loins, Tuna Steaks, Sword Fish Supplier & Exporer, Reef Fish Seafood Exporter, Mahi Mahi Fish Seafood Exporter, Emperor, Red Snapper, Grouper, Ribbon Fish, King Fish, Baramudi, Barakuda, Travelly, Prawns, Squid supplier & exporter in Sri Lanka.